Windows Security has been Compromised is the PUP that uses misleading techniques to prevent removal. Use Reimage to locate malicious components and get rid of them faster than with uninstall instructions. A full system scan blocks virus reappearance and prevents traffic to malicious domains. Windows Security has been Compromised is a scam which is designed to swindle money from gullible people. 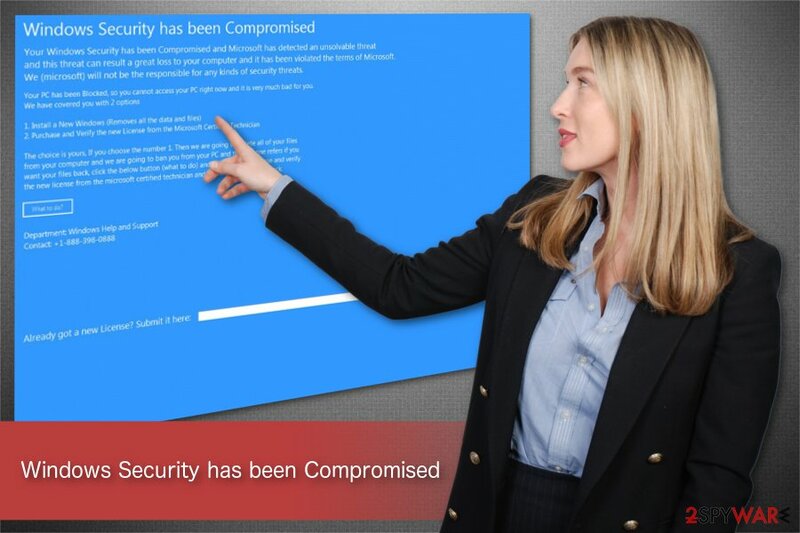 Windows Security has been Compromised is a deceptive notification which appears on the screen during browsing sessions and prevents users from using their browser. The screen-locking feature allows tricking people into believing that their computers are infected, and they must take immediate actions. For that, cybercriminals offer to purchase a new Microsoft License via an inbuilt button on the pop-up window. However, experts note that your system is not infected and you should not click on any content in the message since it is a technical support scam. Windows Security has been Compromised message indicates that an adware program sneaked into your system. Usually, you might unconsciously install it while installing third-party applications from unreliable developers. As soon as it settles, this ad-supported program modifies browser settings to redirect users to a website showing this fake notification. Your Windows Security has been Compromised and Microsoft has detected an unsolvable threat and this threat can result a great loss to your computer and it has been violated the terms of Microsoft. We (microsoft) will not be the responsible for any kinds of security threats. Furthermore, the criminals behind Windows Security has been Compromised virus claim that users and re-install Windows but that would lead to data loss. They indicate another option — purchase a new license key by clicking on “What to do?” button below the message. Windows Security has been Compromised is a fake alert which can also lock your screen. 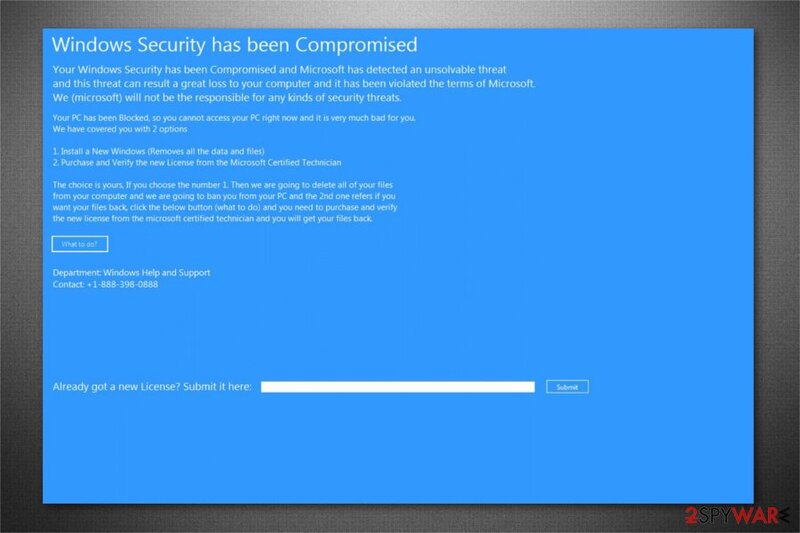 We want to warn you that “Windows Security has been Compromised” message is a scam, and you should never fall for this fake technical support trick. Your computer is not infected, and you do NOT need to pay for a supposedly new Microsoft license key. In fact, you only need to uninstall the adware redirecting you to this message. Keep in mind that you should NOT call via the indicated +1 888 398 0888 number either. Usually, cybercriminals ask to give remote access to the computer to clean the infections allegedly. In reality, hackers install numerous potentially unwanted programs (PUPs) to force you to keep using their services and paying. Our experts say that the easiest way to remove Windows Security has been Compromised message is download and install a robust antivirus software. 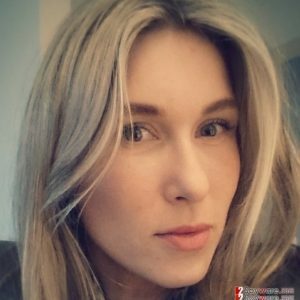 You just need to scan your computer and let it detect all components which are related to the adware and other PUPs. Additionally, a wise decision is to run a full system scan with Reimage after Windows Security has been Compromised removal as it can help you eliminate virus damage and restore any modifications that were previously made. Most commonly, adware and similar potentially unwanted program (PUPs) come in a bundle with freeware so users might not notice how it was installed on their computers. Therefore, it is essential to pay close attention during the installation of third-party applications if you want to keep your system safe. For that, you should reject the Quick/Recommended installation mode once it is offered. Instead, pick Custom/Advanced and attentively follow the steps. Usually, adware appears as a pre-selected checkmark that should be de-selected. Always look for those additional components and reject them. As we have already mentioned, you should start Windows Security has been Compromised removal by downloading and installing a professional security tool. You will find our recommended ones below this article. Although, feel free to use any reliable antivirus of your choice. However, you can also remove Windows Security has been Compromised manually. This method requires specific IT knowledge. Thus, experts recommend it only for advanced computer users. Check the guidelines presented at the end of this article. Here, look for Windows Security has been Compromised or any other recently installed suspicious programs. When in the new window, check Delete personal settings and select Reset again to complete Windows Security has been Compromised removal. Once these steps are finished, Windows Security has been Compromised should be removed from your Microsoft Edge browser. You have to delete unverified entries from Mozilla Firefox and reset your browser. Here, select Windows Security has been Compromised and other questionable plugins. Click Remove to delete these entries. Now you will see Reset Firefox to its default state message with Reset Firefox button. Click this button for several times and complete Windows Security has been Compromised removal. Get rid of Windows Security has been Compromised message from Chrome by uninstalling unknown extensions. Here, select Windows Security has been Compromised and other malicious plugins and select trash icon to delete these entries. Click Reset to confirm this action and complete Windows Security has been Compromised removal. ^ Margaret Rouse. Pop-up. TechTarget. Fuel Your Pipeline Faster. This entry was posted on 2018-09-26 at 07:16 and is filed under Adware, Viruses. You can quickly scan the QR code with your mobile device and have Windows Security has been Compromised manual removal instructions right in your pocket. How did you remove Windows Security has been Compromised?